We delight in indulging in South American cuisine – the flavor varieties, the proteins, and the vegetables used all add up to delectable dishes. 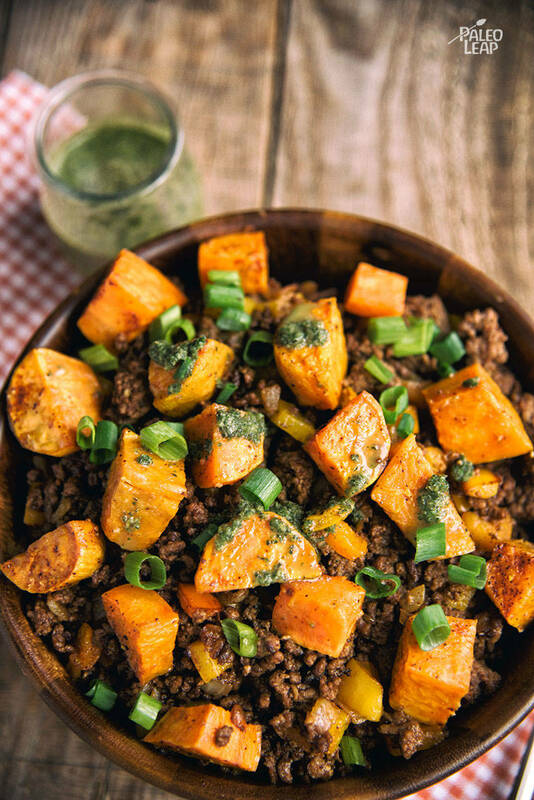 In this Paleo bowl, ground beef and sweet potatoes are combined to create a dish with depths of texture and flavor that will impress, especially for those hesitant to venture too far away from traditional “meat and potatoes” fare. Although the ingredients list is fairly long, this dish comes together super quickly (since you’ll be cooking the meat while the potatoes are roasting). To save time, try prepping your sweet potatoes in advance and letting them hang out with the seasonings in your refrigerator. This dish uses one of our favorite ingredients – ground beef! It’s such a versatile Paleo staple, easy to cook, and fairly inexpensive. Ground beef is chock full of good nutrition too – micronutrients, protein, and a flexible fat content depending on what you select. Of course, not every ground beef is made alike, so watch your labels carefully and consider paying more for grass-fed beef (cheaper is not always the better option). If you don’t have ground beef on hand, don’t despair! This recipe can be easily adapted to any ground meat (turkey, chicken, pork – all will work just as well)! For a traditional pairing, try serving this dish in a store-bought or homemade Paleo wrap (this is a great option for lunch the next day too – just fold your wrap and pop it into the freezer for a quick and easy meal). Since this includes a nice serving of veggies, you don’t necessarily need a side, but consider serving this on top of a simple salad to add some greens to your dish. Toss the potatoes on a baking sheet with the olive oil, lime juice, chili powder, and cumin; season to taste with salt and pepper. Place in the oven and roast the sweet potatoes 15 to 20 minutes. Melt cooking fat in a skillet over medium heat. Cook the onion and garlic 1 to 2 minutes or until soft. Add the ground beef and cook until no longer pink, about 6 minutes. Add the bell pepper and cook until soft (3 to 4 minutes). Add cumin, paprika, chili powder, and oregano; season to taste with salt and pepper; toss everything until well mixed. Serve the ground beef mixed with the sweet potatoes; top with green onions and drizzle with cilantro sauce.